OpenSCAD - [semi-on-topic] print speed optimized sinus support material. integration interface possible?? [semi-on-topic] print speed optimized sinus support material. integration interface possible?? to implement it using scad language only. retractions) in the inbuilt support of my openscad model. export SVG and import twice. something like this directly in the source-code of openscad source? i was unhappy with slic3r generated support for long time. support the part from below. Re: [semi-on-topic] print speed optimized sinus support material. integration interface possible?? With respect to your comments about an "open interface", I feel this is the kind of project that ought to be possible in OpenSCAD. You are taking one geometric object and transforming it into another, and that's exactly the sort of thing that OpenSCAD ought to be good at, especially if the application is 3D printing. As for Slic3r having poor support generation, this was being discussed in another forum that I participate in, and a number of people recommend using Simplify3D instead. Note that Simplify3D is proprietary and costs money, but for some users, that's not a problem. 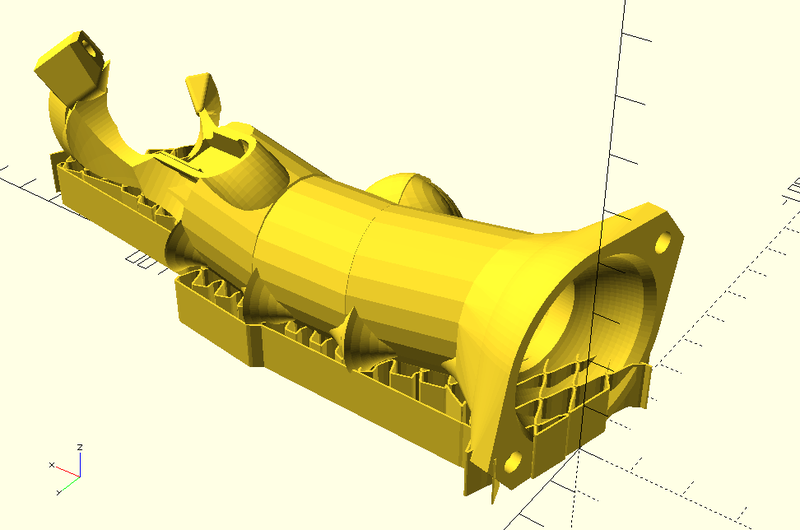 On the other hand, if OpenSCAD made it easier for people to experiment with new support algorithms, then that could allow progress to be made within the open source community without the requirement to hack the internals of Slic3r or Cura. its aim is to minimize sharp corners and empty head moves(with filament retractions) in the inbuilt support of my openscad model. external tool makes the whole process more complicated, you have to export SVG and import twice. so how could i simplify the process? is the only way to implement something like this directly in the source-code of openscad source? it works very good on simple parts, but It fails quite a lot on my complex models, and it fills all gaps in any height. i only wanted to support the part from below. the simple inbuilt support i have created before using n openscad only, always been slowing down my print because of discontinuities and sharp corners. anyways by now i started to think openscad really lacks extensibility, through plugins (like i.e. in inkscape) there would be more efficient possibilities for the problems at hand,perhaps there would alse be less openscad-variants, and more improvements. If the question at hand was, wether to make openscad geomeries querieable or to build the plugin interface, my answer would be a definitive "both"! but i just like you i consider the queriability more important. How do you print your support structures? Do you slice them separately and apply a Z offset? > openscad-variants, and more improvements. support that without completely breaking good things like the quick preview. leap in the end when trying to get the full list of new features. programming language is appropriate (like for reading data from a database). Hm, nice approach, but somehow very ambitious. Support structures are usually more than an stl. They interact with your print as well as with your material. It is a good idea to have it calculated by your slicer. Maybe you try another slicer like Kisslicer before you put a lot of work into that. - close your surface into an object (or a bunch of objects depending on your design) exactly hulling your support structure and export it as STL. - now you can import that STL into OpenScad and do your sine magic there in a generic fashion, intersect it and so on. i just include the support structure back into the .scad code of my model (or import the stl of the model into the support sructure .scad code) they get "Unioned" to a new model with inbuilt suport, which i can export as stl and slice. it is not a "proper" support in terms of own gcode settings (speed, extrusion thickness, etc..) but i do not care as long as i get better results than with the native one. so i just slice it as if it was a part of the models Material rather than trying to acheive it through slic3rs own support structues. Rudolf yes i agree you have a point here. support structures. ( for the parts i have tried so far at least). support is thin enough to easy break it off. heigh,t like in the picture,i have attached, for the same reason. practical enough to quickly get quickly printing support done quickly. you have mentioned in opencad either. thing from the support structure. thinner and move it back just under under the model. works, but it is incredibly slow on a complex model. need to do any of it, but the support will still be very useful. > Hm, nice approach, but somehow very ambitious. > lot of work into that. > design) exactly hulling your support structure and export it as STL. > a generic fashion, intersect it and so on. plugins and the 3d-Dir.scad command; was: Re: [semi-on-topic] print speed optimized sinus support material. integration interface possible?? but perhaps it could be an acceptable compromise for more complex models. waiting for tens of seconds. that is probably why. but that is what .children() was made for right? that woud be almost as good as plugins. yes this could affect the declarativity of the scad code. render() calls could solve it. than have to stay declarative only. i expect people to ask now, why not use shell instead? possible to pass information as command line parameters to the "plugin"
do they need it then? been started from, where are the other files they need, etc. >> openscad-variants, and more improvements. > support that without completely breaking good things like the quick preview. > leap in the end when trying to get the full list of new features. > programming language is appropriate (like for reading data from a database). I often do the same thing when automatic support structures are ineffective. I use posts or sheets that are roughly 0.3 mm in diameter or thickness. If I generate them in a separate module, then I can disable them quickly if necessary. Re: plugins and the 3d-Dir.scad command; was: Re: [semi-on-topic] print speed optimized sinus support material. integration interface possible?? That's an interesting idea. It can be done in a declarative way. The external_transform module takes a shape as an argument, and returns a second shape, which is constructed by executing a shell command. The input shape is written to a file, the shell command is run, then the output file is read to obtain the resulting shape. It allows people to write malicious OpenSCAD scripts. This would be a problem for Thingiverse and other companies that allow people to upload OpenSCAD scripts and execute them on their servers. Hackers could distribute trojan-horse OpenSCAD scripts to attack people's personal computers. A smaller problem is that we'd have to execute the shell script during preview, which would slow down preview. This could be mitigated by caching. A third problem is that the syntax of shell commands is different between Windows, Mac, Linux. We'd want a syntax that is platform independent. The security issues could be mitigated by requiring that external "plugin" executables are installed in an OpenSCAD plugin directory. > That's an interesting idea. It can be done in a declarative way. > is read to obtain the resulting shape. > I see two problems. > preview, which would slow down preview. This could be mitigated by caching. point all the portability and consistency goes up in smoke. Doug, areally good idea for declarative syntax,indeed. concerning the security, it will open a new can of worms, but considering the possibiliies i think it is not the reason not to do it, because it can be made optional. -openscad could display big warning screens with commands before executing the script with the commnds and default toommiting the commands unless the user makesan exceeption. it is not trivial but not all that difficult..
Doug, a really good idea for declarative syntax,indeed. concerning the security, it will open a new can of worms, but considering the possibilities, i think it is not the reason not to do it. -it could be turned off by default and only activated by the user. using OpenSCAD to render them. "? >> That's an interesting idea. It can be done in a declarative way. >> is read to obtain the resulting shape. >> I see two problems. >> preview, which would slow down preview. This could be mitigated by caching. > point all the portability and consistency goes up in smoke. from your answer I can guess you didn't fully unterstand, what I meant. I did NOT mean to use a hull operation in OpenSCAD. 3. close this surface against xy plane (z=0) into an object that describes the full volume (=hull) of your support and write it out as STL. 4. combine your support with your model. This is also straight forward. > using OpenSCAD to render them. "? Why not just fork your favourite open source slicer and modify the support material generation in that? did NOT mean to use a hull operation in OpenSCAD. the full volume (=hull) of your support and write it out as STL. > thing from the support structure. - the projection(cut=false) gets the 'shadow' for each concave part. - linear_extrude the shadow by a layer thickness and hull() it with the original concave part to 'fill' the support volume. - difference off minkowski() all of the original concave parts with a 'small enough' spacer shape so the slicer doesn't try to join the support to the original part. Once you have that 'concave_support' output, do an intersection() with your support pattern for the final geometry.